More than 80 years ago, the newly-constructed St. Francis School in downtown Bend became a beacon of traditional parochial education for the growing town’s Catholic community. Today, the old campus is one of Bend’s most beloved spots to grab a beer, catch a movie, see live music, eat dinner, spend the night and enjoy a relaxing soak. 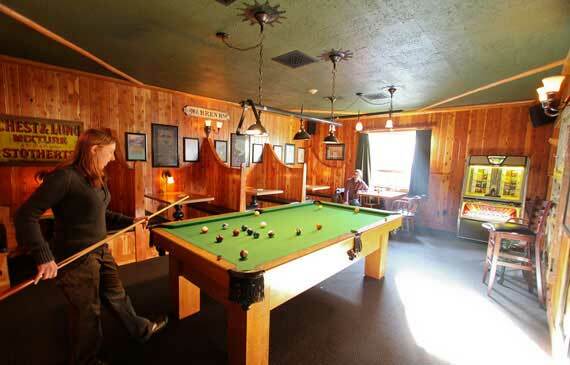 McMenamins is known for taking iconic buildings and repurposing them into beautiful lodging and dining properties. The PNW group renovated and reopened the landmark as the McMenamins Old St. Francis School in November 2004. But all the charm and history of the Catholic school remains intact. The lodging options at the Bend campus expanded to 60 guestrooms in 2016 with the opening of two additional buildings – the Art House and Ed House. The Old St. Francis School campus is truly an all-everything lodging property – conveniently located at the edge of Bend’s thriving downtown featuring dozens restaurants and shops. Here’s some more info on the unique amenities at the hotel. The Old St. Francis School soaking pool is a sparkling gem – semi-enclosed in shimmering turquoise tile work, one is reminded of tropical locales, even while the central Oregon snow or rain falls in through the open ceiling! Admire the luminous stained glass window by David Schlicker and the tiles that were handcrafted, fired and painted by Justyn Livingston and installed by Boyer Tiles into a beautiful mural depicting St. Francis and others harvesting grapes. Set in the schoolhouse’s former garage, O’Kanes is now adorned with church doors – one of which dates back to before the turn of the 20th century – and natural light flooding the numerous stained glass windows. The rare, historic Povey stained glass windows were salvaged from a former Elks Lodge in Portland. Cigar smoking is allowed. Outside, the pub’s large patio, festive lighting and inviting fire pits make it a go-to spot for beers and dining year round. Open daily for breakfast, lunch, and dinner, the pub’s deep booths and original artwork make for a comfortable spot to linger over any meal. Set in the former Catholic school’s main building, our Bend brewpub offers hearty pub fare, handcrafted ales brewed right downstairs in the onsite brewery and seasonal weekly specials. On-site bakers also craft homemade breads, pastries, cookies and desserts, available daily in the pub and at the hotel front desk. The fresh-baked goods are the perfect complement to a cup of McMenamins roasted coffee. On warm days, guests can sit in the outside courtyard to enjoy their food and drinks al fresco. Or perhaps order some pizza to go for a picnic anywhere.